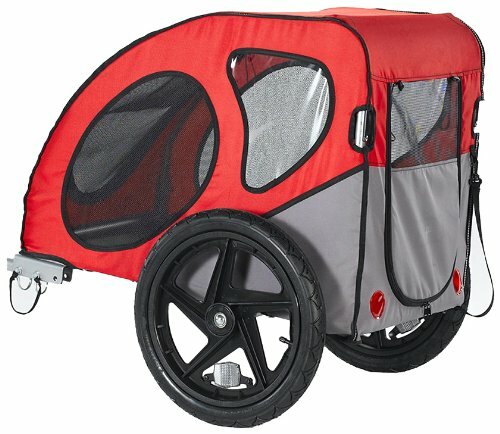 Which Covered Bike Trailer for Dogs Is Best For Your Best Friend? 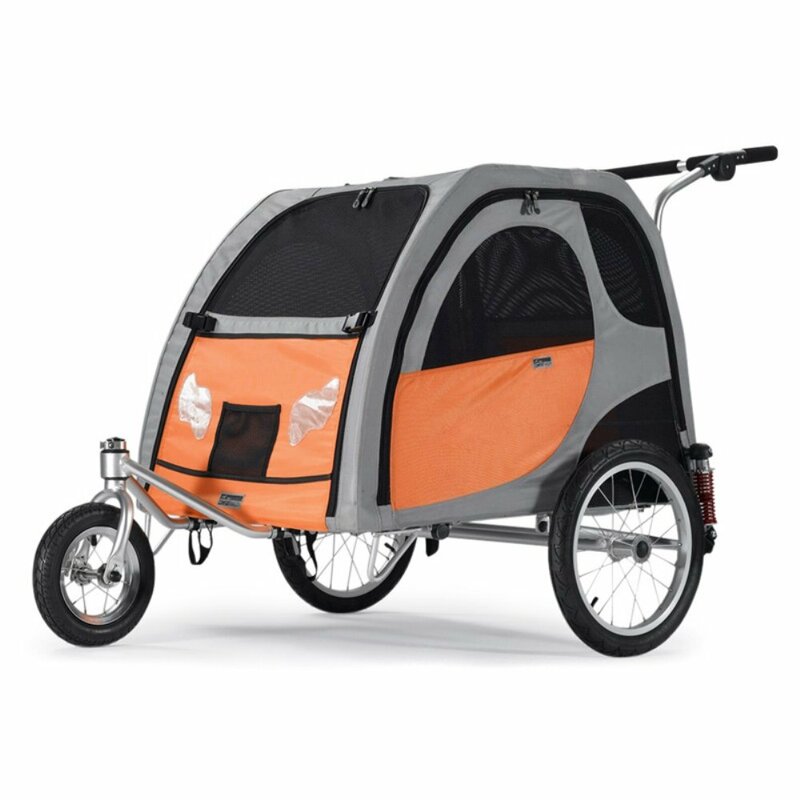 The best covered bike trailer for dogs will let you take your dog with you on your next bike ride. You know that your dog wants to go with you no matter where you go, but running alongside a bike isn't always the best option. A leash and a bike can be a recipe for a disaster for both dog and rider. 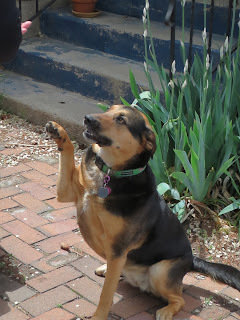 In the summer pavement can be too hot for your dog's paws and too hot for them to run far. Some dogs can't go the distance due to age or size, that doesn't mean they want to miss out and stay home! Check out these nifty trailers and find the one that will work best for your furry friend. We purchased this because our Siberian Husky has bad knees, she can walk, just not for long. We wanted to return to biking and didn't want to leave her home. This is the unit that Solv'dIt...... It follows the bike great, she fits and is comfortable. Actually she likes to ride with her head out the top saying hi to everyone as we ride by. It is easy to get the animal in and out. Just alot of fun and a great way to have a family outing. 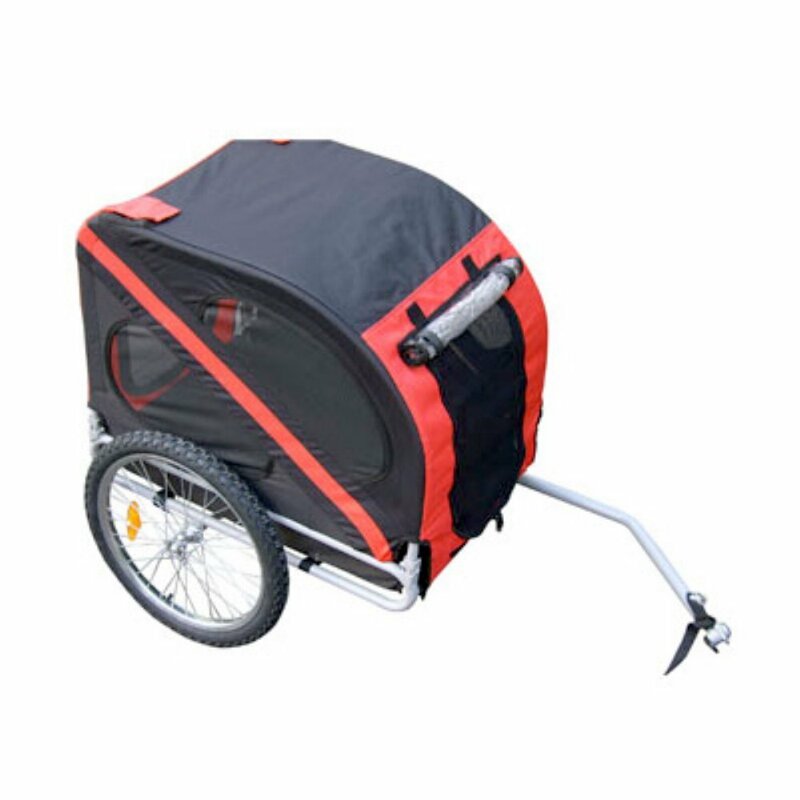 Take to the streets or hit the trails with the Mdog MK0001 Comfy Pet Bike Trailer - Red/Black. 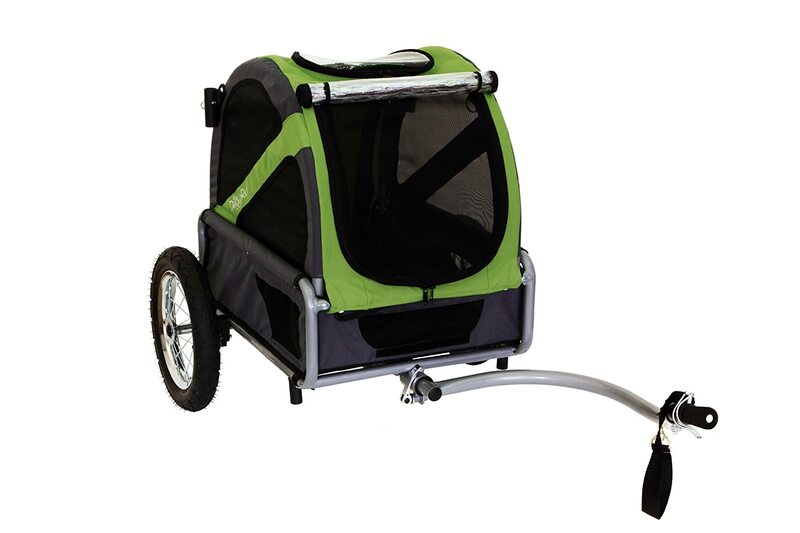 This trailer attaches easily and is perfect for the pet on the go. It features a sun roof, clear front, quick-release wheels, and a durable construction. Interior dimensions: 29.5L x 21.7W x 25.6H in.. Zipper roof opening. Leash attachment. 600D poly cover with mesh windows. Transparent PVC front cover. Waterproof. Folds easily. Quick-release wheels. Wheel size: 20 in. (rear). The Kasko Pet Carrier is a sporty "new" pet carrier that easily attaches to your bicycle so that you and your pet can go places. We love taking our dog everywhere with us! This is a great trailer with a great price. Easy to assemble! I purchased a crate pad for the bottom, as there is not cushion. The dog rides around like a queen! Unlike other trailers these trailers connect to the axle and not the frame of the bike. Connecting to the frame can bend your frame and wear the paint. 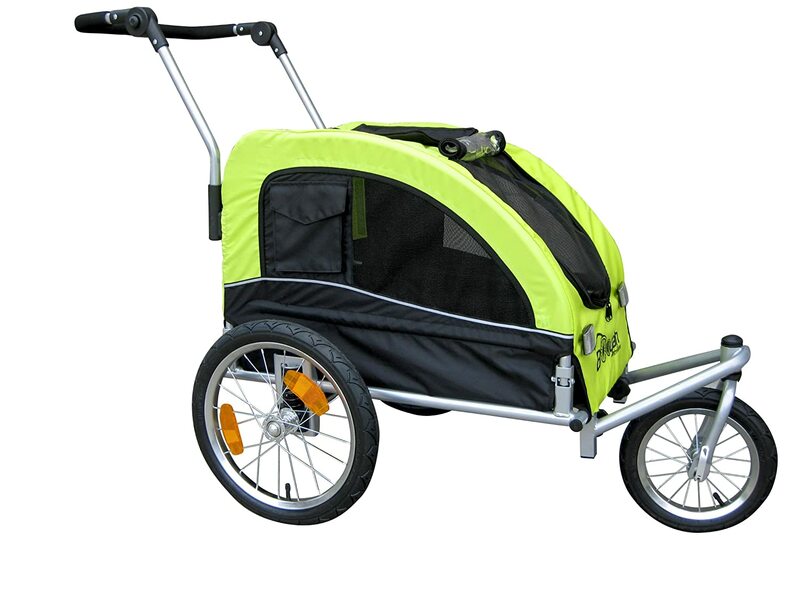 Bike stroller and bike trailer. Remove front wheel when used as a trailer. 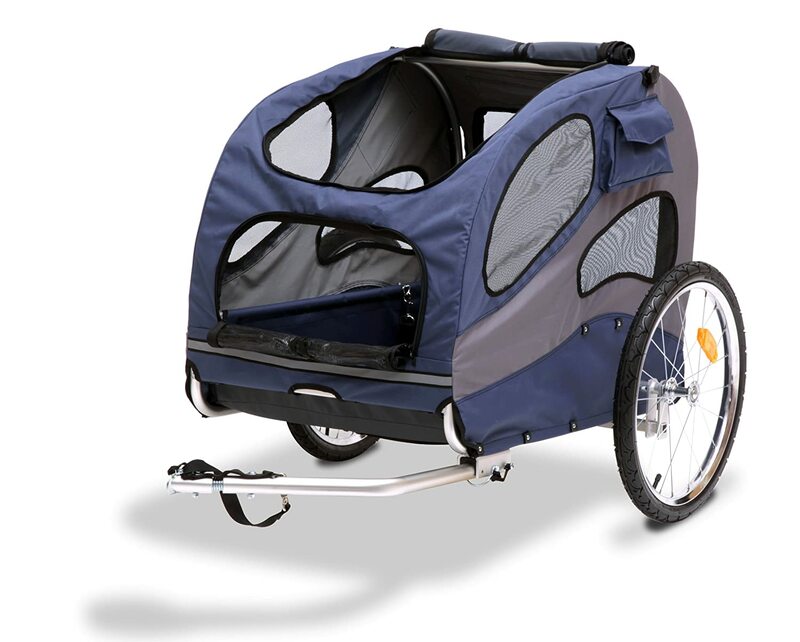 Petego Stroller Conversion Kit for Comfort Wagon Pet Bicycle Trailer The Petego Comfort Wagon Stroller Kit accessory converts your Petego Comfort Wagon Bicycle Trailer into a push stroller. The stroller kit includes adjustable handlebars and a pivoting front wheel for easy control. 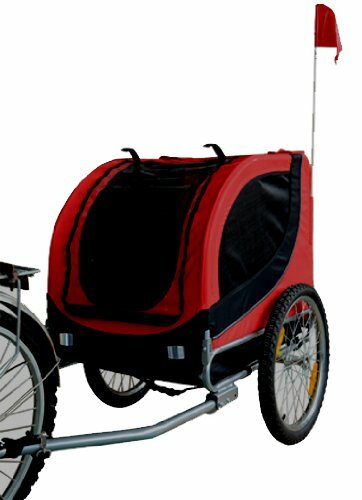 The Comfort Wagon bicycle trailer is sold separately. The stroller kit converts an existing Comfort wagon into a stroller. Inspired by our own rainy Dutch and Pacific Northwest weather, we created the Original/Novel rain cover to act as complete rain jacket for your DoggyRide. 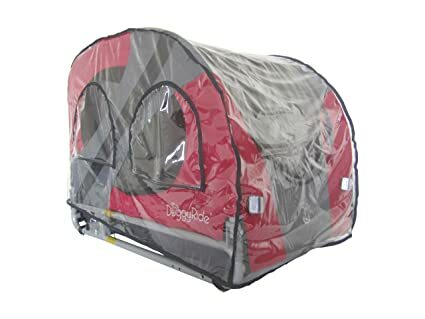 This rain cover is made of clear plastic allowing for your dog to still have maximum visibility out from the cabin, while you can still safely see your dog inside. The rain cover has two side ventilation pockets which allow for your dog to still experience air flow inside the cabin. Want to use your DoggyRide on two different bikes? 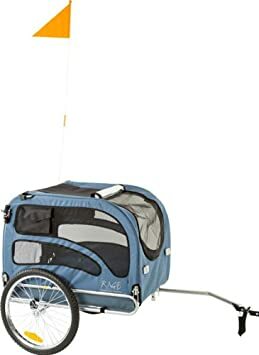 Having an extra hitch available is a quick and easy way to attach your DoggyRide dog bike trailer to a different bicycle. 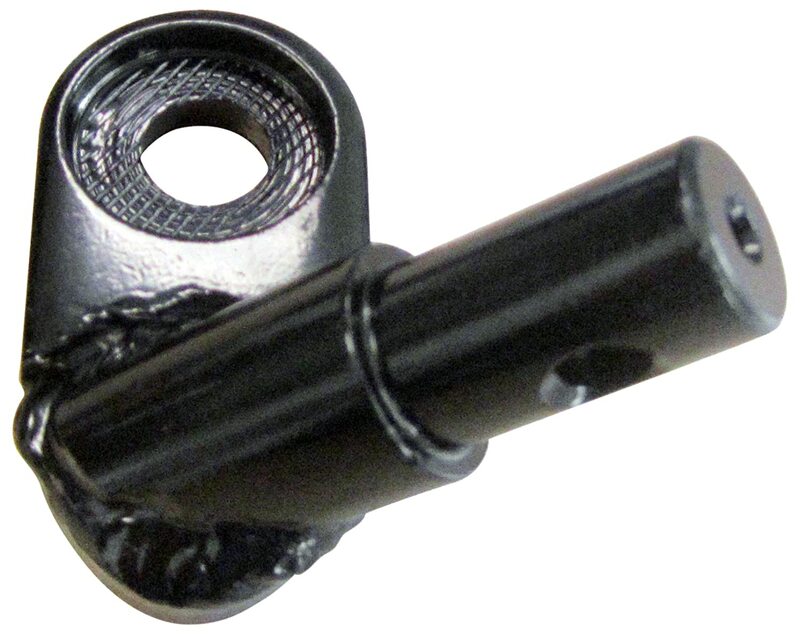 Attach this additional hitch to another bike axle and you're ready to ride. Ready to go biking with your dog in its DoggyRide? 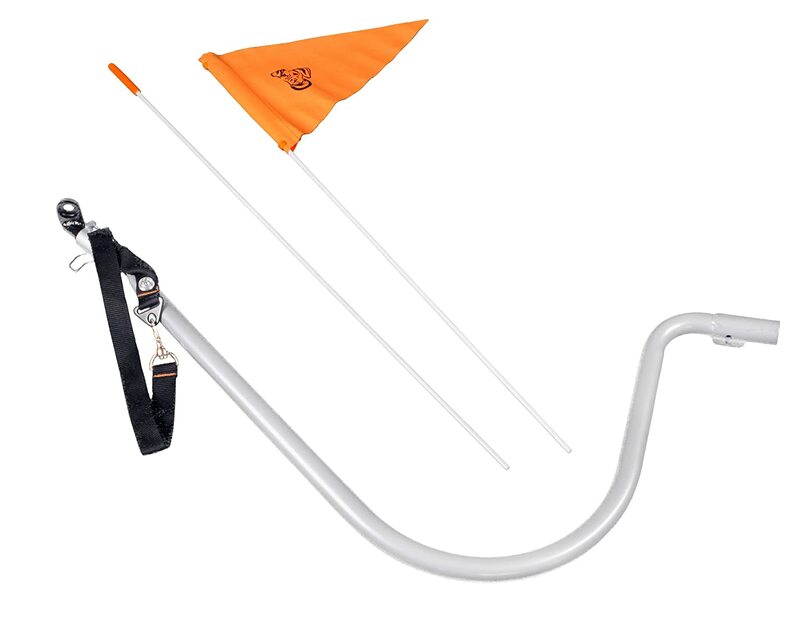 This bike conversion kit for the Original or Novel stroller will convert a stroller to a bike trailer with the addition of the tow bar arm, hitch and safety flag. Off to your next adventure. Your animal's skin functions as a protective barrier and is likewise the biggest organ of its physical body. Healthy and balanced skin is critical to your pet dog's overall health. Being in call with so many exterior elements the skin could develop issues that, if left unattended, can come to be detrimental to your animal's health. If your pet needs good veterinary care when on a trip. dog has a trouble it is most likely to feel continuously itchy and will certainly wish to scratch and lick itself to try and soothe the soreness, at the same time aggravating the skin trouble further. It can be a difficult cycle to damage therefore it is essential to address not simply the exterior signs of a skin trouble yet additionally the hiddening source. Common problems in pets feature allergic dermatitis, mange, ringworm and parasites. A skin problem might be a sign that your pet's diet plan is doing not have in something essential. If you have any type of uncertainty about the underlying reason for a skin issue, always take your pet dog to a veterinarian. Sensitive dermatitis could be created by the inhalation of allergens, direct contact with allergens or even from the consumption of allergens. It can as a result be challenging to determine the specific underlying cause. Your animal will certainly scratch and lick itself frequently and hair reduction may happen because of this. Mange is most generally created by a problem of mites that burrow into the skin and cause itching. You pet dog will certainly desire to scrape itself frequently and you might notice a solid odour. Ringworm is an infectious skin problem reason by a fungi and you may see irritated and scaly, balding areas on your pet's. Fleas and ticks could also create major troubles if left untreated. Your veterinarian will manage to determine the hiddening reason for the infection and might prescribe medication to help yet there likewise measures that you could take on your own to stop the incident of issues and to manage them. Getting veterinary care in Orem can be easy as checking out the listings for pet care. Regular bath time and cleaning will ensure that your animal is parasite-free and will certainly also give your attention any skin troubles. Keeping your pet dog's environment clean will certainly minimize its direct exposure to feasible allergens. Feeding your pet dog a diet regimen abundant in omega oils will make sure that its skin is kept in a healthy disorder. Lastly there are a number of organic solutions that can be used to manage certain skin problems and keep your animal's skin healthy and balanced. Like us our pets too feel cold when the temperature level drops. Canines with thick and long fur such as collies, Golden retriever and German shepherds can manage a slight drop in temperature level. We need to provide additional attention for old as well as really young animals. It is always much better to make use of water proof coat when it is sprinkling. Regardless of age and size all pets need coat during cold climate specially during early morning and late night when temperature drops below regular. Exactly what kind of fabric you should choose? For a bitterly cold day much better choose a fleece-lined water proof coat or seat shirt, covers are also a great choice however you need to ensure that it covers neck, rump and all four legs there by keeping the pet comfortable and safeguard there necessities. Consider these points while picking a coat or coat. Dog collars should not limit your pets movement. It should not be tight or loose fit. Decrease the danger of allergy by avoiding the use of synthetic fibers particularly part that comes in direct touch with the skin. A reflective stripe must be chosen the coat to detect the animal in dark. Pets clothing must be washed daily so much better to purchase 2 sets. It is essential to groom the animal twice a day after eliminating the cloth as fur can get tangled and breed infection. Constantly utilize blankets at evening to keep your pets warm and safe. Use of heater can trigger dehydration. These are some of the custom collars that you have to follow when taking care of your pets specifically throughout the winter. Like us our pets too feel cold when the temperature level drops. We require to provide extra attention for old as well as really young animals. Regardless of age and size all pets need coat during cold climate specially throughout very early morning and late evening when temperature level drops below typical.